My Home and Garden: This small Fall Gold Raspberry is my canary in the coal mine. This small Fall Gold Raspberry is my canary in the coal mine. I dug out this small runner from my Fall Gold raspberry. As readers of my blog know, I lost all of my Meeker Raspberries last year, and then all of my Tulameen Raspberries this spring. They succumbed to Root Rot. The Fall Gold Raspberries are seemingly immune. They are in the same bed, but down at an end of their own. 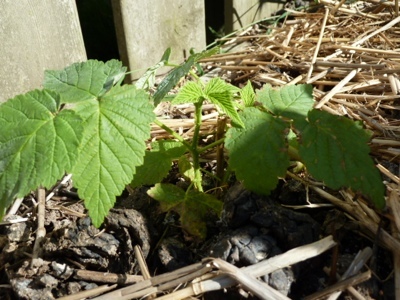 To be sure, I took this small runner and planted it right in the midst of the dead red raspberries. If it is truly resistant, I will replant the raspberry bed with these incredibly delicious gold berries.